Overflowing with intrigue and frequently startling with the unexpected, Sorana Santos' debut album Our Lady of Stars on her own label 'I Dream in Sound' feels like one of the most delightfully original vocal jazz offerings of the year to date; a recording whose original compositions and performances progress with delicious unpredictability until they eventually seep into one's soul. A graduate of the Guildhall School of Music, the creative outpouring of South-Londoner Santos is multi-faceted – pianist, guitarist, vocalist, composer, lyricist, poet. And, influenced by her studies of, amongst others, Karlheinz Stockhausen and Edgard Varèse, as well as embracing jazz, rock, soul and the singer/songwriter tradition, all combine to build these interpretations of fourteen of the darkest women's stories to be found in the Bible. These are depicted "from their own unique perspective as they deal with discrimination, childlessness and unrequited love; a portrayal of their battle against the inherent darkness of the human condition." Sorana Santos' personnel on this recording comprises James Maddren (drums), Joe Wright (saxes, flute), Alex Bonney (trumpet, cornet) and the strings of the Ligeti Quartet. 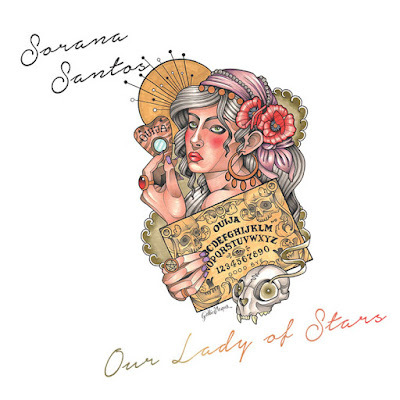 What makes this such a distinctive project is the way in which the impassioned drama of Santos' voice is so integral to the instrumental balance – worlds apart from the simple notion of upfront vocalist with backing musicians; and the singly-named tracks (for example, Salome, Lilith, Jezebel) tantalisingly provide no clue to the engagingly differing sound worlds that develop. But, interestingly, a password-protected URL quoted on the album sleeve invites the listener to follow Sorana's lyrics, as well as view her fascinating notated manuscripts. With or without reference to its inspiration, this collection is compelling, right from the opening number Abigail whose free vocal ("I am the night you draw into to wait for the dawn") permeates a repeated, reversed, echoic chant, followed by the emotional rock groove of Sarah (Santos' hard vocal suggesting all the intensity of, say, Patti Smith or P J Harvey). The brooding new-age folkiness of Mary reveals the leader's prepared piano (a light chain across the strings) which becomes an effective feature of this album, whilst piano/vocal-dominated Ruth hints at Joni Mitchell or Tom Waits (Santos' intuitive piano creating pleasing textures). Joe Wright's earthy tenor sax multiphonics and loops introduce the brief spaciality of Rachel ("And now my heart is as barren as I") before deep, heavy-metal piano chromatics and Maddren's thrashing drums launch Salome, its overwrought, emotional vocal giving way to cacophonous trumpet and tenor – a powerful episode indeed. One of the album's standouts is delivered in the form of Sorana's prepared guitar, which provides an infectiously rhythmic, dulcimer-like backbone to Jael, the '60s 'protest song' feel vocalised superbly. Sustained internal piano effects reminiscent of John Cage define the edgy foreboding of Lilith, as disturbing wordless drones hover around; and the shrill dissonance of the Ligeti Quartet appropriately accompanies Santos' brief, dark lyrics. More hopeful in mood and theme is the steady, countryfied air of Miriam, opening into a beautiful blend of assertive, string-led instrumentation (including Alex Bonney's muted trumpet extemporisations) and soulful voice; and subtitled 'hymn for a wedding/funeral', Jezebel exudes a quiet, disembodied gospel feel as its bizarre 'tape-damaged' manipulations become strangely captivating. Hannah's melodic plainchant is punctuated by an abstract undercurrent of electronics, whilst the metallic, bell-like prepared piano calm of Martha erupts into full-band solidity; and to close (or so it might seem), a reprise of the opening chant but with the addition of random instrumental voicings and improvisations, ad infinitum. In current jazz circles, the originality of this album might be comparable to the work of, say, Alice Zawadzki or Lauren Kinsella – and yet Sorana Santos' distinct inventiveness and musicality leaves a different impression, not to say a good deal of unexpected shivers of pleasure. A great talent – it'll be interesting to see where this album leads. Stunning review! I'm pleased to have my very own copy ! !